In keeping with its reputation for size and spectacle, Texas has produced a staggering number of stars. Although many hailed from towns too small to have a post office, they occupied the spotlight on the largest of stages. Roger Miller’s songs made him the “King of the Road,” and Howard Hughes stretched his vision across the skies of the silver screen. Gene Autry won fame as a singing cowboy and Van Cliburn wore a tuxedo to international piano competitions, but both hailed from the Lone Star State. Texans penned Old Yeller and voiced Daffy Duck. From Buddy Holly to Ginger Rogers and Joan Crawford to Jimmy Dean, Bartee Haile charts the brightest constellations of Texas entertainers. Bartee Haile began writing “This Week in Texas History” in 1983 for small-town and suburban newspapers across the Lone Star State. Thirty-five years and more than 1,800 columns later, it is the most widely read and longest-running feature of its kind ever. 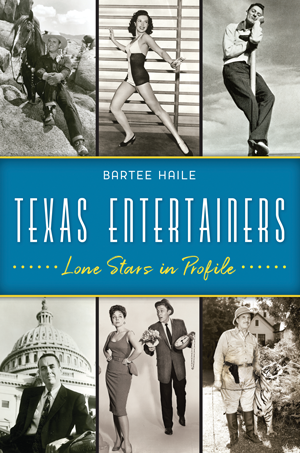 Texas Entertainers: Lone Stars in Profile is his fifth book for The History Press. The master storyteller’s earlier titles are Texas Depression-Era Desperadoes, Murder Most Texan, Texas Boomtowns: A History of Blood and Oil and Unforgettable Texans—all fascinating page-turners. A fourth- or fifth-generation Texan (like most Texans, he can’t say for sure), Bartee Haile lives in the Houston area with his wife, Gerri.